Recently I have been reminded that God commands us to bear with one another. Bearing is “something that is difficult to do or deal with…” Bearing takes effort. Think about it. Do you bear eating cheesecake or a hot fudge sundae? No. We bear with difficult people or people who are different than us or people whoirritate or annoy us. 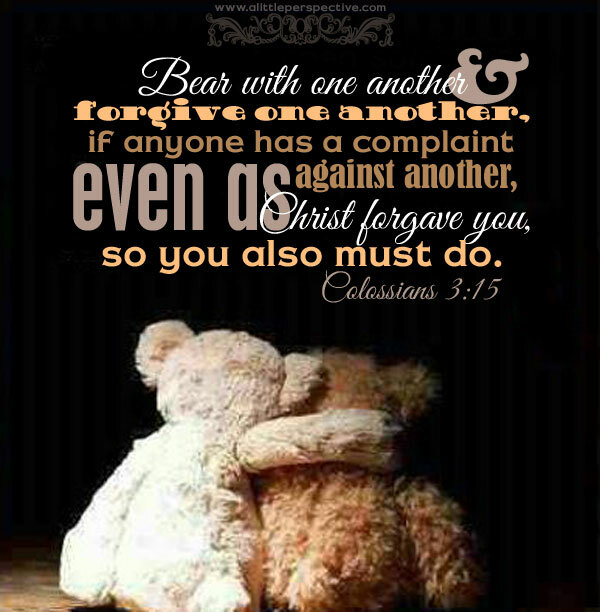 We have to bear with people who have hurt us or have sinned against us. Say what? You say. What does God’s Word say? I couldn’t help but notice that each of these 3 verses state or allude to the necessity of humility to bear with one another. In Romans 15 it says “not to please ourselves,” in other words putting me aside so I can build up another. Humility by any other name is still humility. Ephesians 4 and Colossians 3 also both refer to humility. We can understand that, right? To bear with another will require humility in my heart to serve them rather than serving myself. #3: Bearing requires intention, listening, time and energy. So here’s my question for you and for myself: How are you bearing?